Yet another in the growing list of Dianius's Guides To Doing Mad Things With Druids! 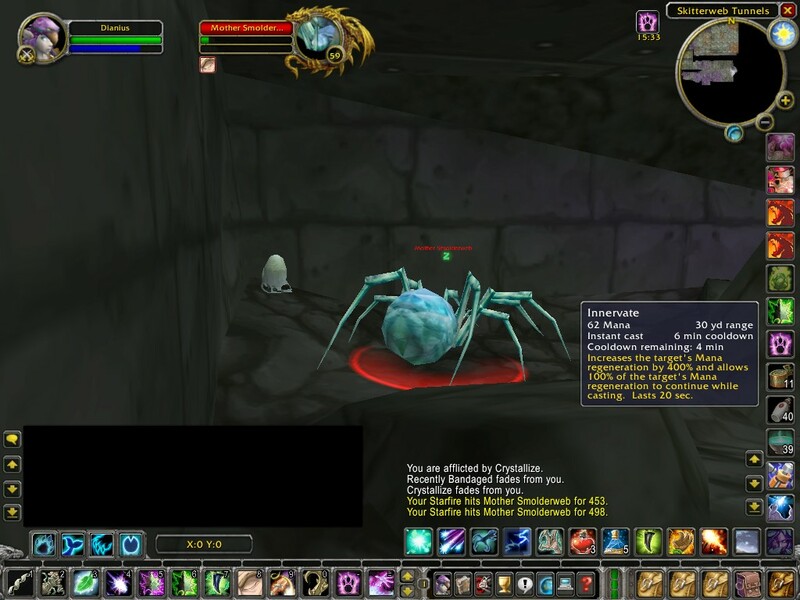 8-) This time, soloing Mother Smolderweb to try to get the Wildheart Boots. 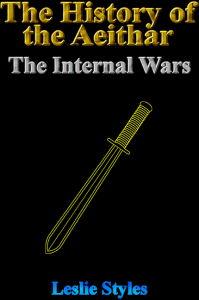 The main index to all my Guides is here. There are essentially two parts to soloing Mother Smolderweb... getting to her, and killing her. Neither are easy if you don't know how, hence this guide 8-), so I'll be covering both in fair detail. Rather than miss out something important, I'll be assuming that you've never used Stealth before and need to know everything. Sorry if any of it seems condescending. 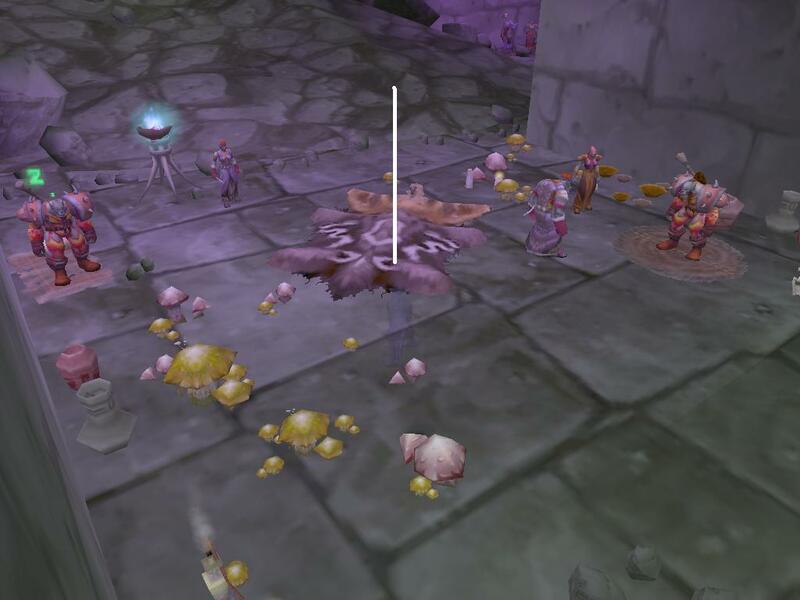 I should point out here that I'm not in an Uber Raiding Guild, I run a small friendly guild, and so this guide should be usable by everyone, even the little folk like me! I did this with no points in Improved Prowl, although I do have Innervate which saved me a fortune in mana potions 8-) The only other talent points I have which have any real effect is two points in Improved Starfire, as the chance of stunning her and so getting a free shot is nice, but not at all vital, and Nature's Swiftness, which can be handy for repositioning her. Heavy Runecloth Bandages. Again, you don't absolutely have to bring these, but they'll save you mana, which makes things easier, and First Aid is so easy to max out why not do it? 8-) The reason I say bring Heavy Runecloth rather then the lower ones is for speed, the faster you can heal up the better, as you'll see later. Ok, so you have your supplies, and you're all ready to go, so where is she? She's inside Blackrock Spire, an instance inside Blackrock Mountain, which straddles the border between Burning Steppes and Searing Gorge. 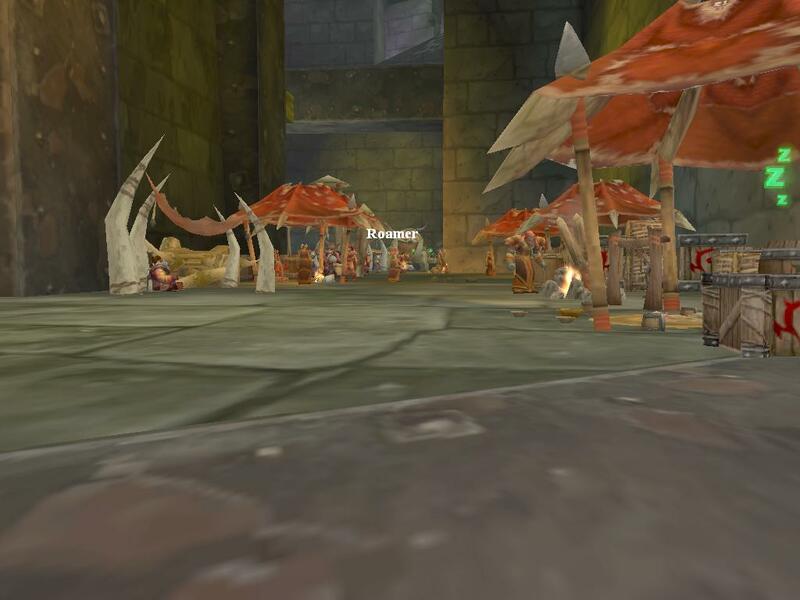 Blackrock Spire has two halves, Lower Blackrock Spire (LBRS) which is where you start when you zone in, and Upper Blackrock Spire (UBRS), which is accessed from inside LBRS using a quested key. Luckily she's in LBRS, so you don't need the key. She's about half way through the zone, so it takes a little work to get to her. 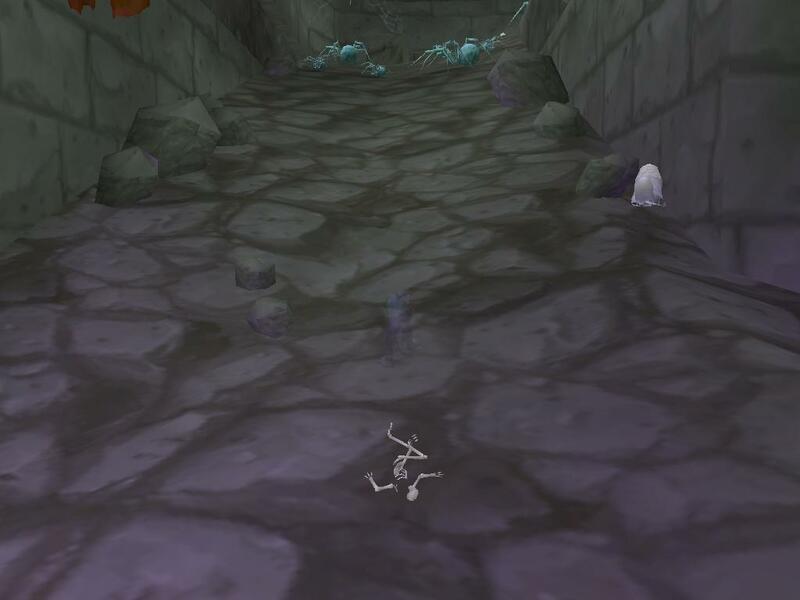 If you die (and you most likely will), you appear at the Graveyard at Thorium Point in Searing Gorge. It's a simple trip to the South West of the zone to get back. 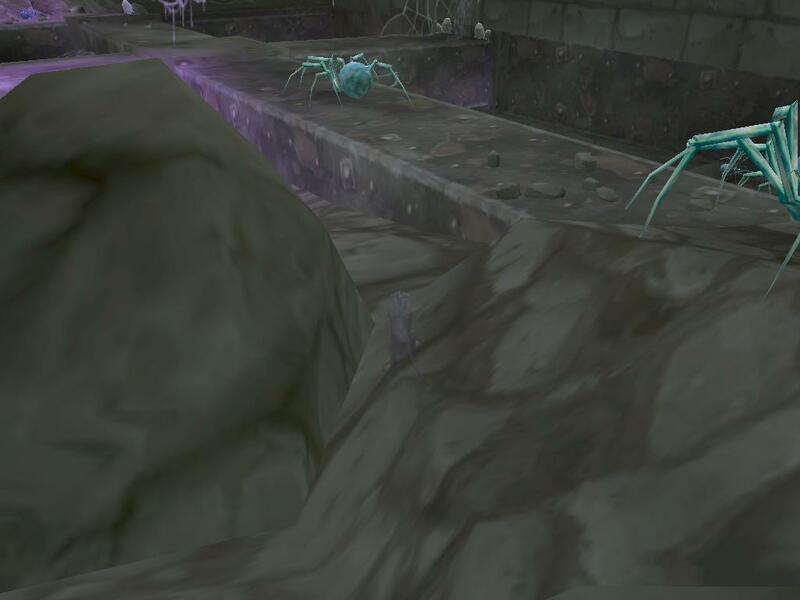 Once inside Blackrock Mountain, there are no mobs until you get close to the instance entrances, so it's safe to move around a bit. There are two instances inside the Mountain, BRS and BRD (Blackrock Depths). 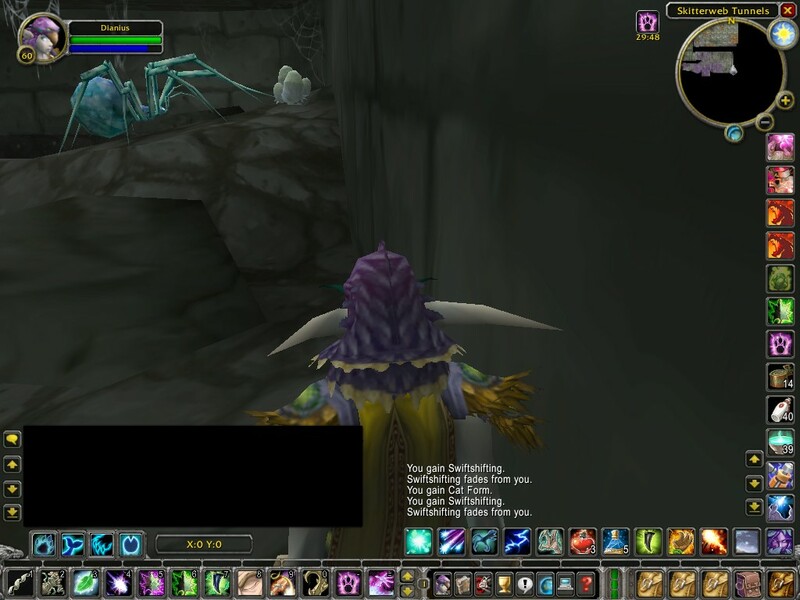 If you travel around the ring in Blackrock Mountain, you will find a meeting stone for Blackrock Spire, and a tunnel leading to it. DO NOT GO IN HERE! It leads past lots of Orcs, and while it's possible, even easy, to Stealth past them, there's no need, as there's a cunning shortcut you can take! If you go to the northern (and highest) point on the ring inside Blackrock Mountain, there's a chain leading down to the floating island in the middle, and a rock ramp on the west side of it allowing you to climb onto it. Go up onto the chain, and then go left and up the chain, and drop off the end onto a shelf. It's very dark at this point, so you might need to turn your gamma or brightness up. Follow the shelf round to the right and up, and you'll see a balcony ahead of you. There's a gap just before the balcony, so you need to jump the last few feet. Once on the balcony, look into the room and you'll see the instance entrance to BRS. 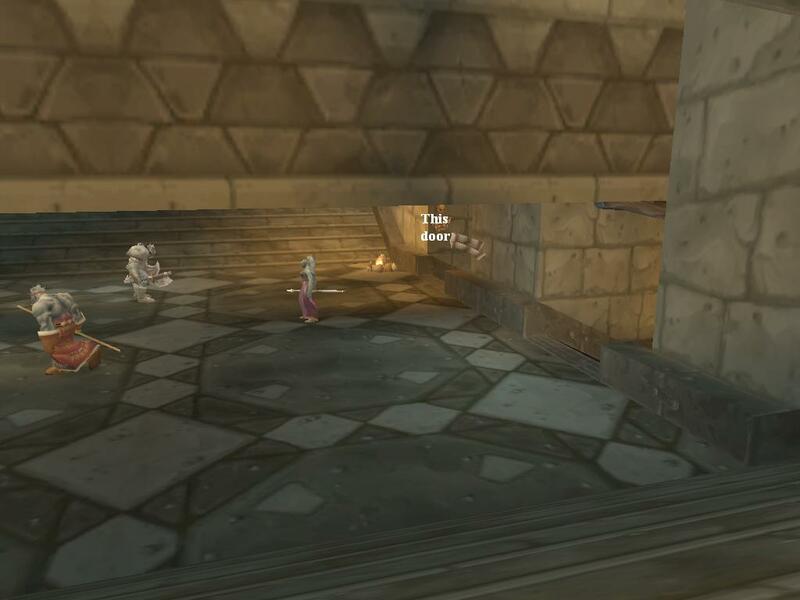 There's also a door to the right, don't go through there as there are Elite Orcs. This would be a good time to cover the basics of Stealth. 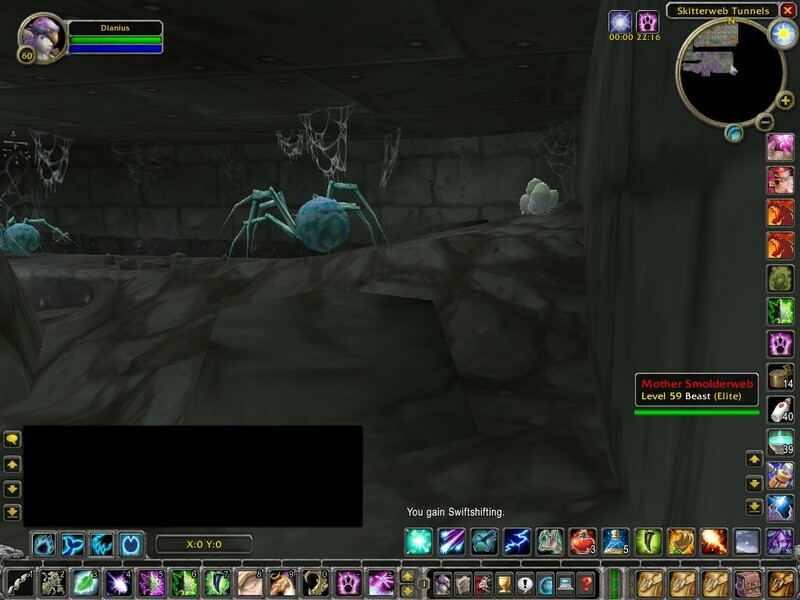 Stealth in WoW is quite different to Invisibility in other games such as EQ, in that it's not 'Stealth up and nothing will see you', but an agro-range reducer. Get close enough to something and it WILL see you and attack. 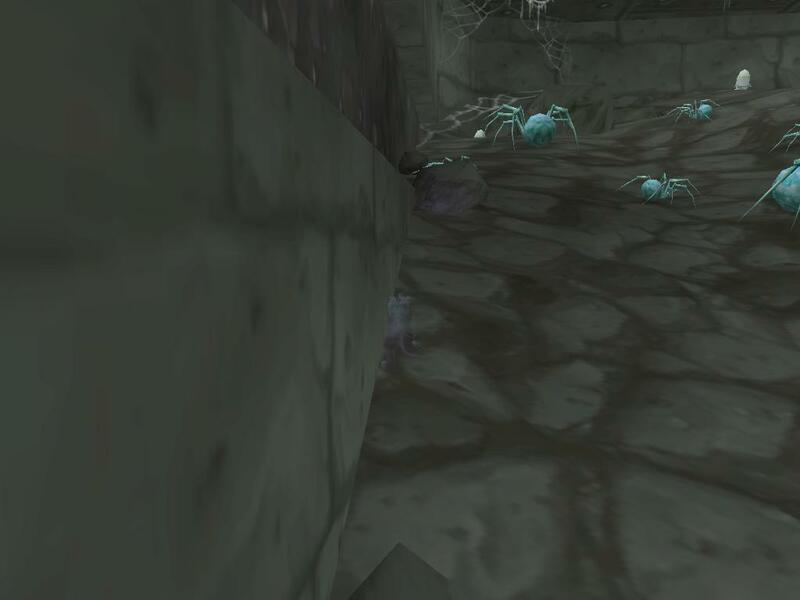 There are also mobs with Detect Stealth, who see you at an even wider radius. How close you can get to a mob without being seen is determined by how much higher or lower level than you the mob is. 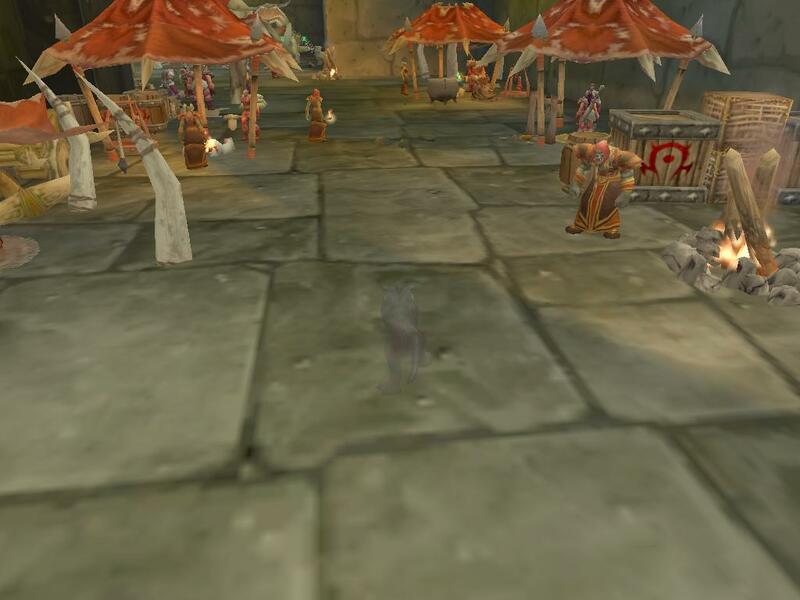 For mobs lower than you your agro radius is very small, about the same size you are in fact, so unless you walk right into the mob you're usually ok. However, the higher above you the mob is, the further away it'll spot you from. If you get close enough to trigger the 'Did you hear something?' reaction, the mob will turn to face you (and if it's a roamer, stop walking and stare at you). While this is very scary when it happens, as long as you don't move the mob will eventually shrug it off as the wind or something, and turn back to what it's doing, allowing you to carry on. Those two agro ranges are VERY important here, and I'll be referring to them a lot. Zone into BRS, and you're at the bottom of a ramp. This is a safe spot, so once you're in you can Stealth up quite safely. 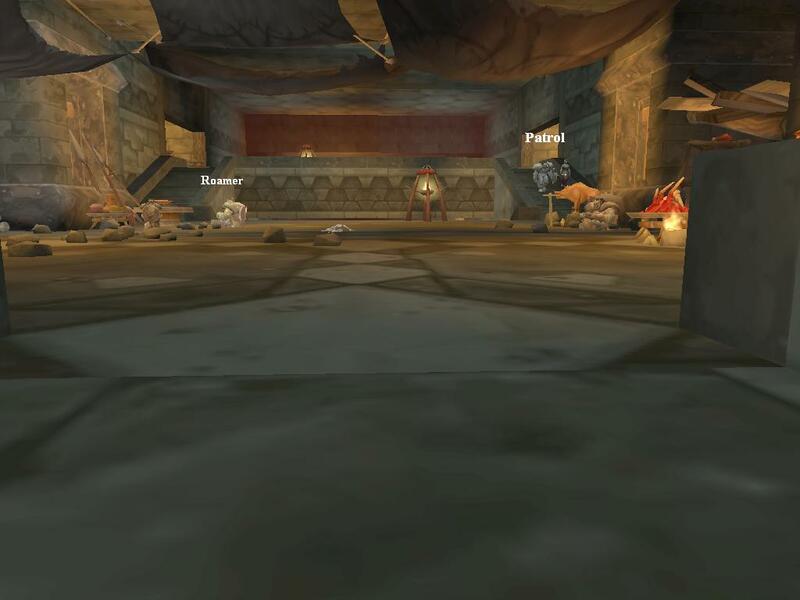 Head up the ramp, and there's a room with various Orcs around the edges. They won't react to you at all as long as you stay in the centre of the room, however the one at the end will wander from side to side as it gets chunks of the roast pig and goes back to the table to eat it, so you have to be careful of that one. Also, there's a patrol of two that circle the area and cut across the end of this room, again mind them. First room, with Roamer and Patrol marked. Across the room there are ramps leading up at either side, and a big ramp down across the centre. You want to head down the ramp, hugging the right-hand wall. There are two doorways in that wall, you want to take the second one. You will get *very* close to an Orc as you go, but it doesn't react, so hug the wall and you'll be fine. Once through the doorway, you're in a short passage that leads to quite and open area. 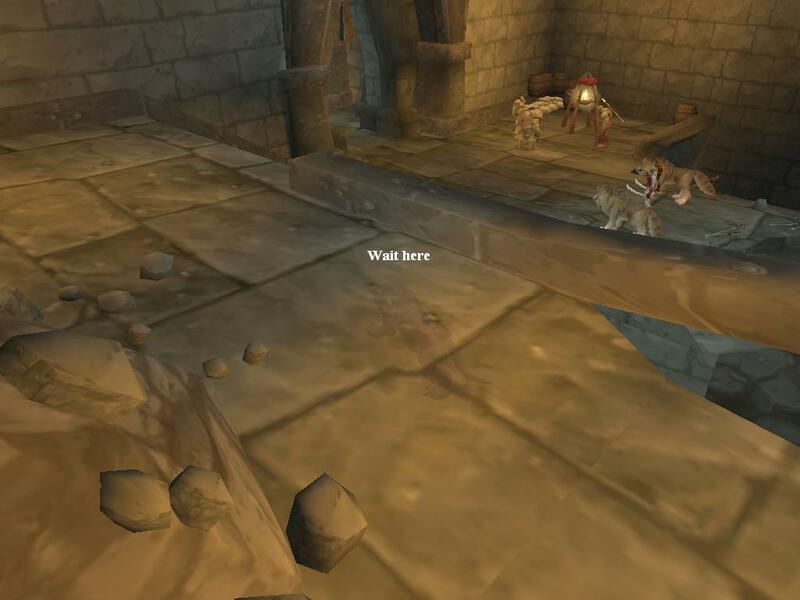 Two Orcs patrol into this passage, and they both react, so be very careful here. You want to wait 'til the patrol leaves, and then move down the passage and a little to the right. At this point, wait for the patrol to come back, and when they go past you up the passage you just came from, head off down the ramp and through the doorway on your left. This saves you having to hide from the patrol in the tunnel, which is possible but riskier. Once into the passage, follow it through and you come out in a large chamber. At this point, turn sharp right and move away from the door so the patrol don't spot you when they come back. This is the view you'll see after turning right in the chamber. 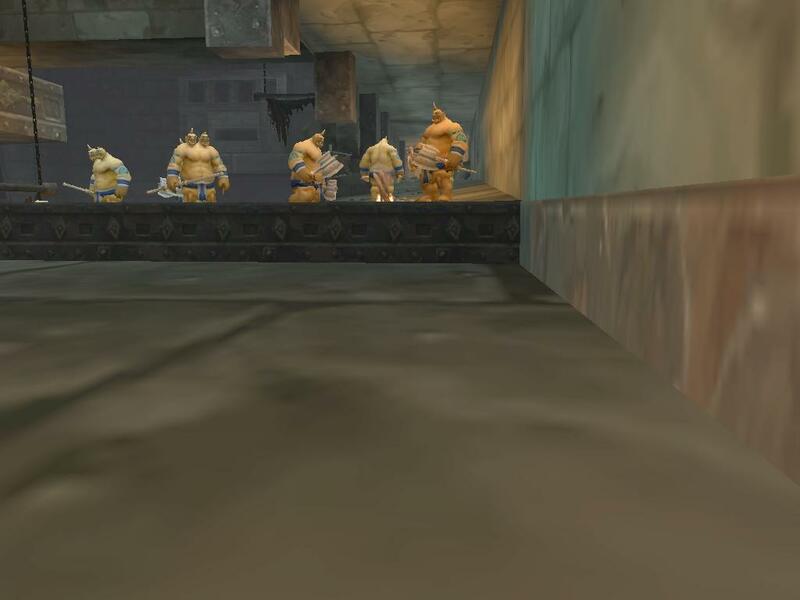 You can safely ignore the Ogres, they're actually on the other side of a chasm. You, however, are going into that chasm! It's a handy shortcut that saves a lot of work. Move forward until you're on the wall, and you'll see two rock platforms below you. Jump down onto the first, walk to the end, and down onto the second. You then need to head down the second to the left-hand side corner. 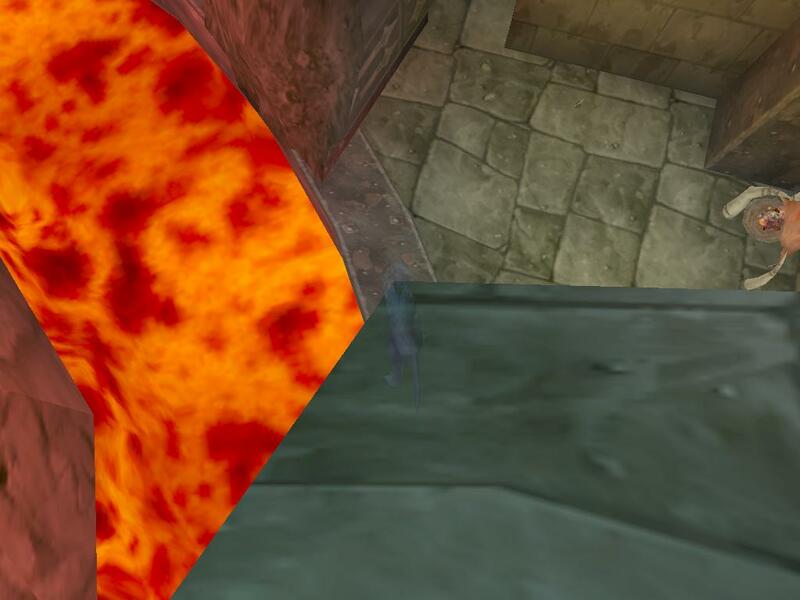 Looking down, you'll see a lava river, a metal edging, and a stone path. You want to jump off and land on the metal edging. View over the edge, showing the metal edging. 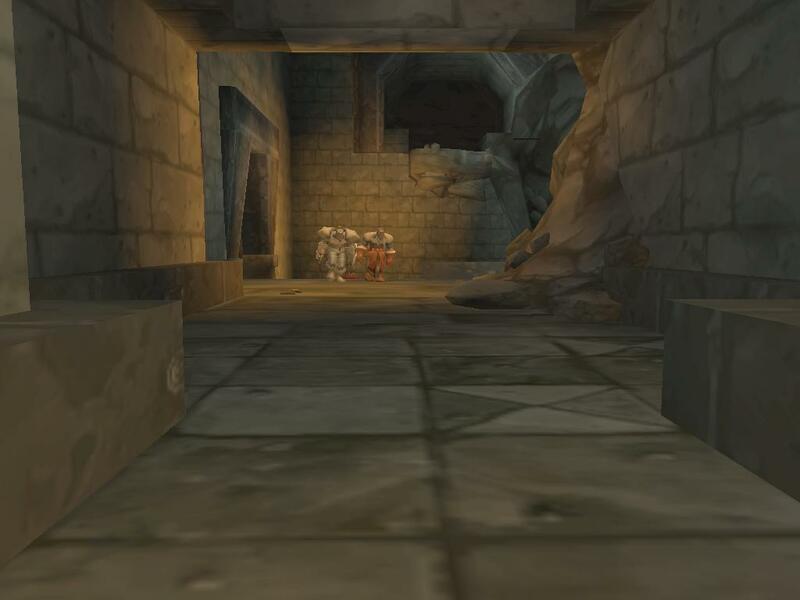 If you turn to look down the corridor, you'll see it is *packed* with Orcs, with only a very small leeway in between. To make this even harder, there is a single-Orc patrol that comes down it, and a Roamer half way down who wanders from side to side and stands in the middle. From this point on, you need to have a very steady hand, be very patient, and most importantly of all be in third-person view. Personally I like to play in first-person, however this section is quite simply not possible that way, you have to be able to see all around you. Timing is important here. The first thing you have to do is wait for the Patrol to come down the corridor towards you. It might stop and stare at you, however as long as you're standing on the metal edging facing down the centre of the hallway you'll be out of attack range, so just be patient and let it wander off again. Now, once it's gone it's time to set off. If you're lucky, the Roamer shown in the last picture will have wandered onto the right hand side and be easier to pass, however it doesn't stay there long, and is your biggest obstacle for this section. Moving down the corridor, and an Orc reacting. Having made it past the first lot, the corridor continues round to the left. 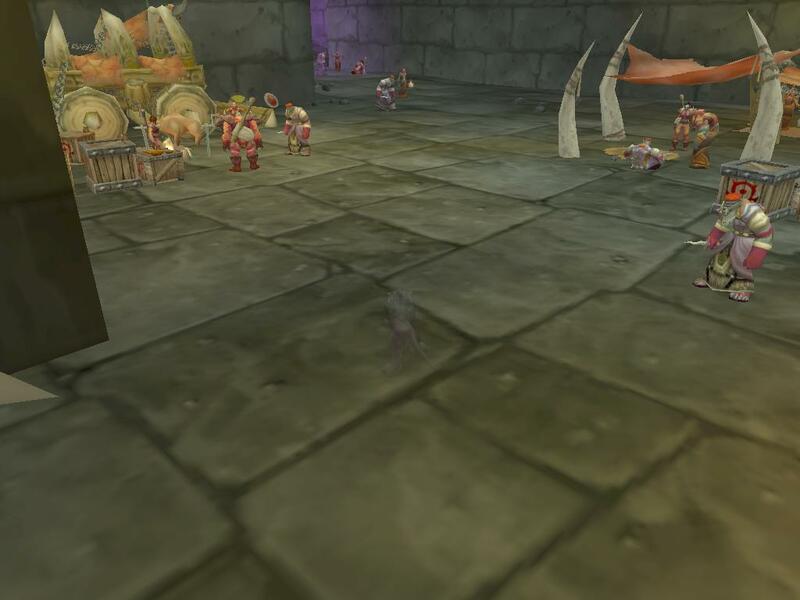 Although the Orcs are more spread out here, they still react and you have to still be careful. Heading round to the left. You're heading to the far wall, and ultimately towards the group containing the sitting mob you can see top centre of the last picture. 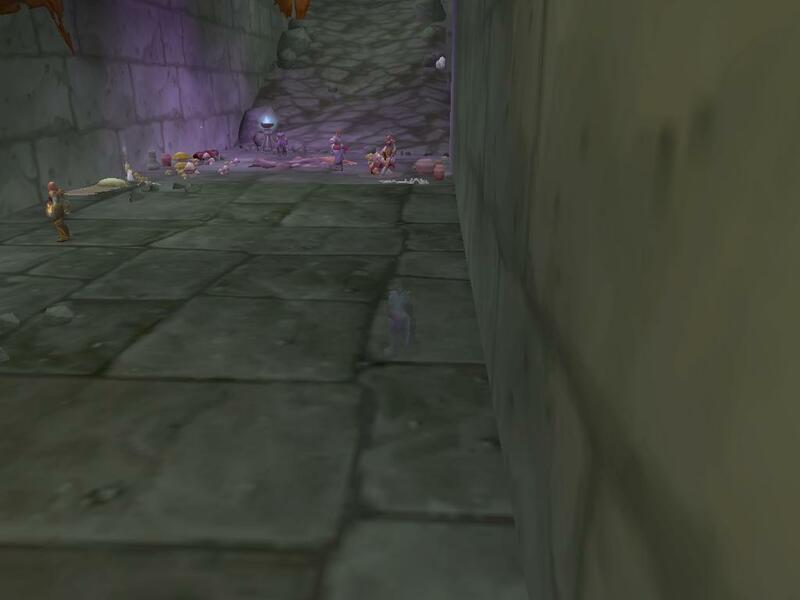 This part is the bit that requires the most patience, as (at level 56 certainly) you have *barely* enough room to squeeze through these mobs, and most of them react. You need to cross to the left hand half of the passage, and squeeze diagonally through the mobs as show in the next picture. The mob with his back to me in the picture doesn't react, however the other four all do, so you have to take this literally a step at a time. When you're certain that none of the mobs are looking at you, take one step forward and stop, then wait until you're certain you're clear again and take one more step, then stop again. 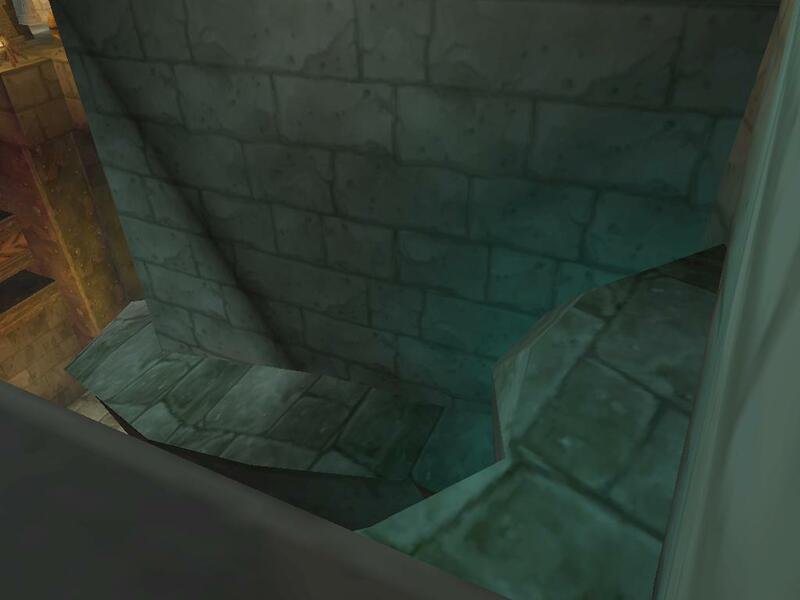 Keep doing this until you get onto the ramp, at which point you're clear of the Orcs. 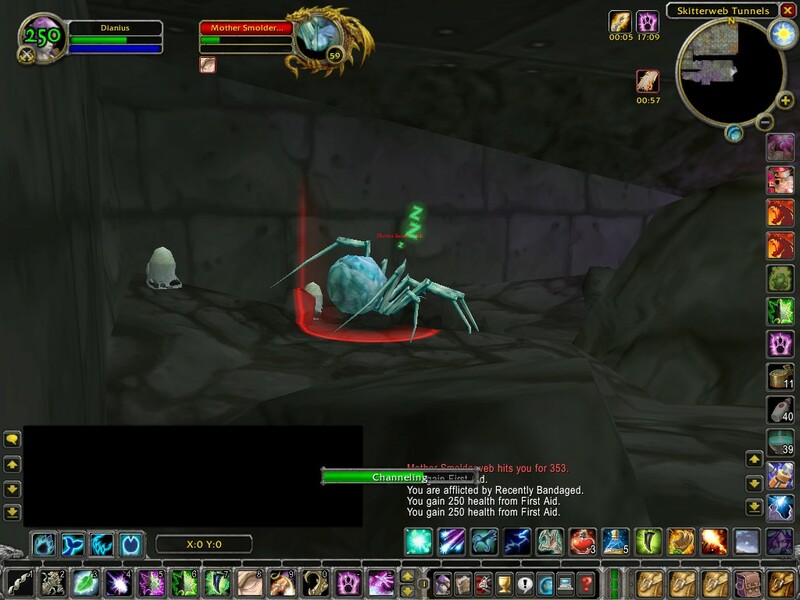 Congratulations, you are now past all the Orcs... now it's time for Spiders! To get past these, you need to hug the left-hand wall up to just below a couple of boulders, as show here, and then wait. There are three spiders you need to keep your eye on here, the little one to the right of the boulder, the little one behind the boulder, and the big one just past them. Eventually all three of them will wander away from the left hand wall, at which point you head up. You need to watch yourself here, there's an overhang you can see in the previous picture that you can get stuck under. Once past those three spiders, carry on up into the top left corner. Turn right, and follow the wall past Mother Smolderweb. Keep going all the way to the far side. As well as Mother Smolderweb herself, there is one other spider you need to be aware of, a roamer that wanders up and down the girders. 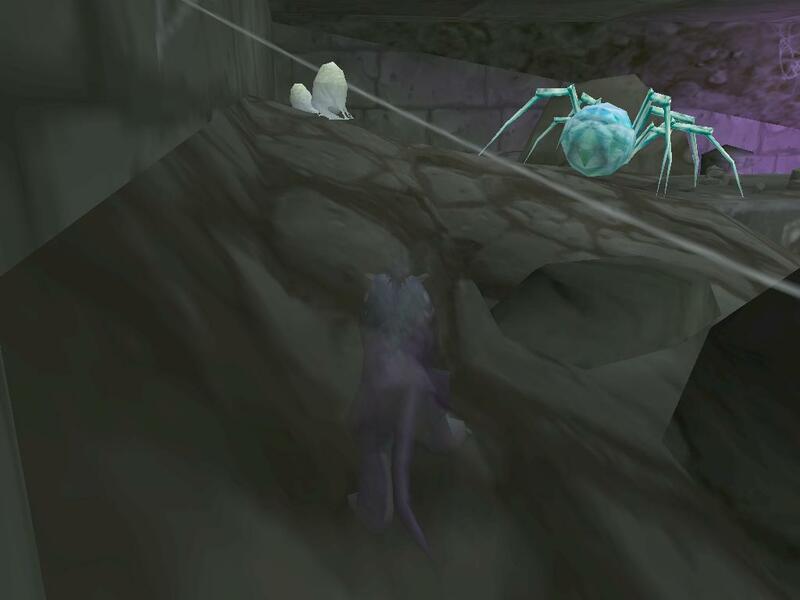 Mother Smolderweb moves around a little bit, and if she's at the girders end of her path as shown below then it's vital that you wait for the roamer to leave before pulling her, otherwise you'll agro that too, and that'll agro all the others nearby, and then it's game over. BTW, if you took all your gear off before starting the Stealth in, now is the time to put them back on again! So, Part 1 of the guide, Getting To Mother Smolderweb is over... now for Part 2, Killing Mother Smolderweb! Secondly, and equally importantly, is that you need to have Abolish Poison hotkeyed. You will need this a lot! She procs a poison called Mother's Milk, which has the very nasty effect of making you cast an AoE web explosion, which has the two very nasty effects of glueing you to the floor and interrupting casting. It is therefore essential that you get rid of it as soon as she's back asleep. It takes a few seconds before it goes off, so you have time. If left uncleared, it will keep going off every few seconds. The third thing is something you probably all know, but as I said at the start I'm going to cover everything just in case... You can cast buffs, heals and cures on yourself (or anyone) without changing your target away from the mob. This is very important here as you cannot afford the delay in re-targetting her if Hibernate breaks at a bad time, and it will! 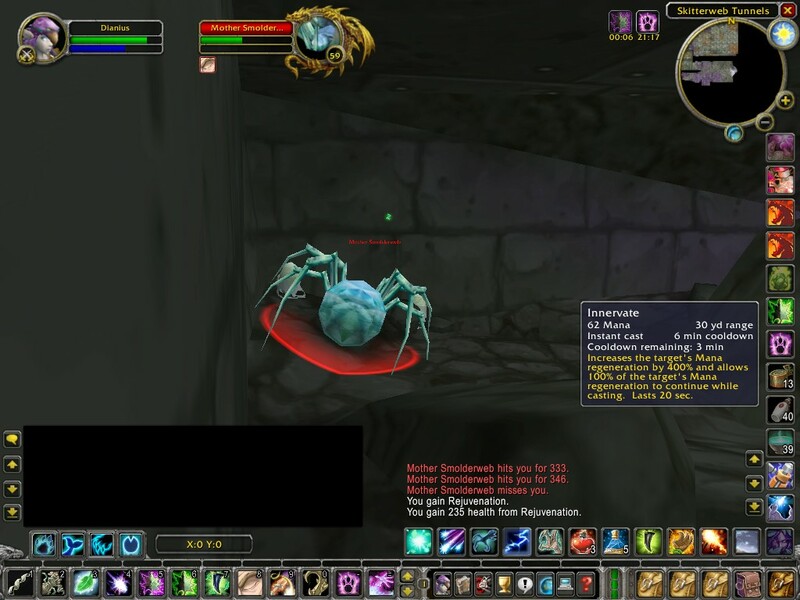 So, keep Mother Smolderweb targetted at all times, and if you need to cure the poison or heal yourself or Innervate, then do it like this: Press the spell hotkey (or click the icon, but that's slower) and then press F1 (or click your portrait, again slower). If you do it in that order you will keep Mother Smolderweb targetted, but cure or heal yourself. The same is true if you need to bandage up, press the Bandage key then F1, and you'll bandage without losing her as your target. Finally for the pre-start info, the key here is keeping her asleep with Hibernate. That is the #1, #2 and #3 priority! It is not as easy as keeping a bog-standard mob under either, she will frequently break it early. When she does this you *must* immediately stop anything else you're doing, even if you're half way through a cast, and put her back under. You have to keep out of her melee as much as possible, or you're toast! Ok, so by now you have your supplies, you're in position, and you know the drill... time to get our Spider on! During those 1.5 seconds you were casting Hibernate, she'll have moved towards you. For this first pull she might not have got very far, or she might have got all the way up to you. If she's barely moved, stay where you are and do another Starfire and Hibernate, and this time she'll stop very close to you (which is exactly what you want). You now simply repeat this process over and over again... Starfire and Hibernate, move to the other side, and Starfire and Hibernate again... Remembering all the time that if she breaks Hibernate early, stop anything else you're doing (usually casting Starfire) and immediately re-Hibernate, and move out of her way. As you can see from this picture, it takes a long time... I refreshed Mark of the Wild before I started, and so far 9 minutes have passed. You can also see from this picture that I have by now used Innervate. You will see in all the subsequent pictures that I keep my mouse over the Innervate icon, so that I can always see the countdown until I can use it again... that countdown is your lifeline, if you run out of mana before it's hit zero, you're dead! What you *must* do therefore is conserve mana as much as possible, and the easiest way to do that is to wait a few seconds after getting into position before casting Starfire / Hibernate again. Let the mana build back up a little bit, and then start again. Don't give it too long though, as I said she does like to wake up early! 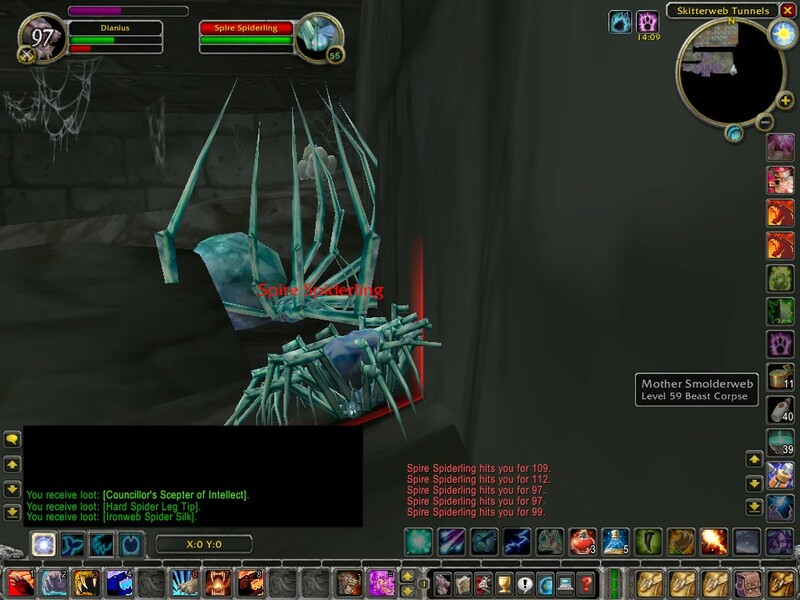 As you can see in that last picture above, I took a lot of damage, I got stunned and then she resisted Hibernate... this will happen a few times every fight, more until you get the hang of it. The key here is to not panic, keep working on Hibernate, and only once you've got her under should you worry about healing up. Unless of course she gets you dangerously low, in which case click a Health potion and go back to trying to Hibernate her. Once I had her back under, I moved to the new position and bandaged myself, all the time keeping her targetted and one finger on the Hibernate button... even if you're bandaging you have to stop it to re-Hibernate her the instant she wakes up. If you took the Nature's Swiftness talent, you now have a nice little trick up your sleeve! As you know, it makes the next Nature spell you cast into an instant cast spell. Everyone knows that's heals and the Wrath nuke, but what a lot of people don't realise is that Hibernate is also a Nature spell, and so is affected by Nature's Swiftness. Starfire, however, is an Arcane spell, and thus unaffected. So, the trick for getting out of a 'she's gonna get me!' situation and back into the 'Ahhh, she's miles away' place you want is simple... cast Nature's Swiftness on yourself first, BEFORE casting Starfire. Then cast Starfire on her as normal. As it's an Arcane spell Nature's Swiftness will still be up. Then pause for half a second or so, just until she starts moving, and then hit her with the now instant-casting Hibernate. Provided she doesn't resist it (always a possibility), you now have her nicely dozing away near to you without ever having got close enough to hit you, and it's back to the cycle. If you don't have Nature's Swiftness, or you already used it and the timer's still counting down, then the best thing to do in this situation is to cast Rejuvenate on yourself just before casting Starfire, so that when she does get to you you still have a few seconds of high regen left to soak up some of the damage. At this point, there's a good chance that your next Starfire will kill her. That's obviously a good thing, but it does also have a downside... when she dies, a horde of little spiders will spawn from her corpse, and they will kill you. Oh, did I forget to mention that at the start? Yup, you're on a suicide mission, there's no way you're coming back from this alive, sorry! When you get to the point that you're pretty sure your next Starfire will kill her, cast Rejuvenation on yourself before casting Starfire, and as well as the finger over Hibernate also keep a finger over Dire Bear form. If when you cast Starfire she doesn't die (even if you're certain the damage will be enough, she could resist it) re-cast Hibernate, then re-cast Rejuvenate and start again. When she does die, however, immediately cast Dire Bear form. You can loot as a Bear, and have the advantage of more HPs and Armour, giving you longer to do so. All that remains now is to run in and loot the corpse. The little spiders will attack the moment you get near her, so you have to be fast. If they haven't attacked yet and you have enough mana left, you can de-Bear and stack Regrowth and Rejuvenate on yourself, then re-bear and go in, to give yourself the maximum looting time, however even with no regen Dire Bear will give you enough, so it's up to you. As you can see, she didn't drop them for me on this run, or any of the dozen or so previous runs, or the half dozen group or raid runs at her I've done too... basically, she hates me! 8-( Still, my revenge upon her is that now hopefully lots more people will kill her too, muhahahaha! Now that you're dead, you can run all the way back to BRS and zone in again to res yourself, and then gate home muttering to yourself about how that Spider's going to get hers one day, and prepare for another run tomorrow! 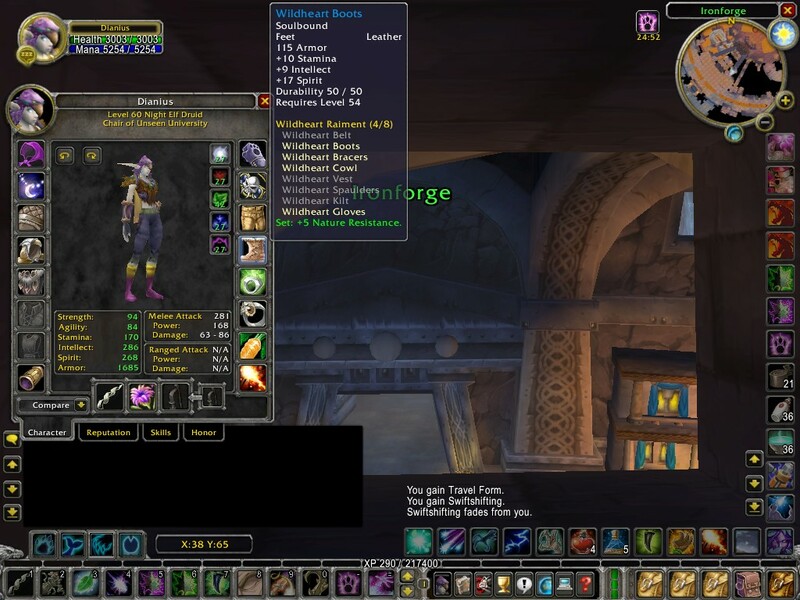 The good news is that at least she'll drop a Green item if you don't get the boots, which will easily cover your repair costs from the death at the end. Well, that's it for this guide, I hope you enjoyed it, and that you'll offer up a quick plea on my behalf while you're strutting round in your new boots that one day I'll get mine! *Scene: A dingy office. The lights are turned off, and empty junk food boxes and cola cans are strewn everywhere. These are, however, dwarfed by the piles of empty Pro Plus boxes. *Players: A Dev. He looks disheveled, overworked and underpaid. Caffeine addiction has clearly taken it's toll. His left leg can't stop shaking. You can't help but think there's an invisible dog attached to it. He's browsing the boards on his 5th PC, whilst trying to fix four classes simultanously on the rest. The mouse is in my hand! Come, let me click thee. I wrote thee not, and yet I see thee still. Proceeding from the caffeine-oppressed brain? As this which now I write with the other hand. Who only occasionally add, thus with her stealthy pace. Moves like a ghost. Thou sure and firm-set Cat! *Time passes, nukes land, Hibernates hold, and ultimately the Dev emerges victorious and bootied-up. Finally! I've been after those boots for EVER! Cursed be The Management for forbidding us to use GodMode on the Live servers! Hmmmm.. I should reward Dianius for showing me the way... but not too much, I'll make her work for it! There! Let's see what she thinks of THAT! 8-) Now all I have to do is get them to rush out Patch 1.7, even though it's still not ready, so my 'reward' goes live! Right, now to go wake up Thundgot and get him to log his Enchanter on, I want these buffed! Have I missed a step somewhere? Got some info wrong? Or perhaps you just loved the Guide and want to let me know? You did that HOW many times?!?! ?